← The Winter has been a rough one, but it is not keeping us down at Pure Joy Farm! 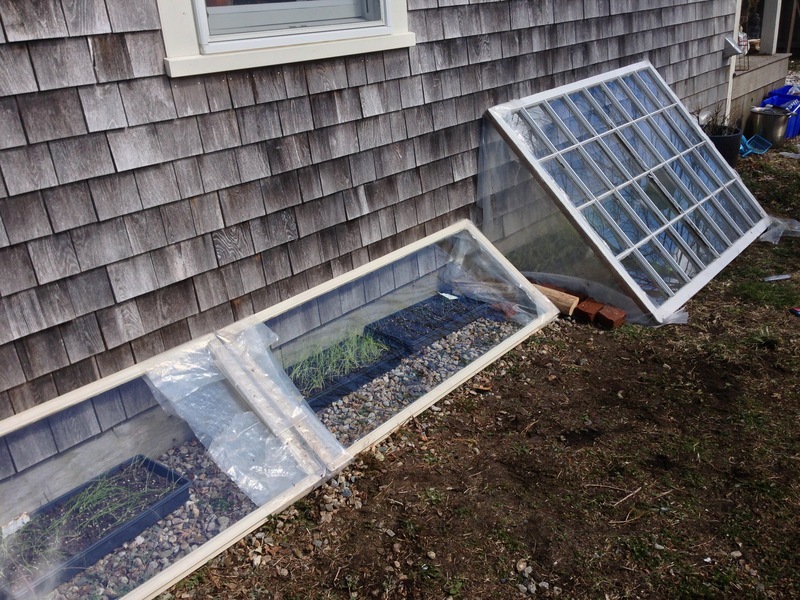 Our adventures in simple cold frames! Just a few windows leaned up against the side of a house! 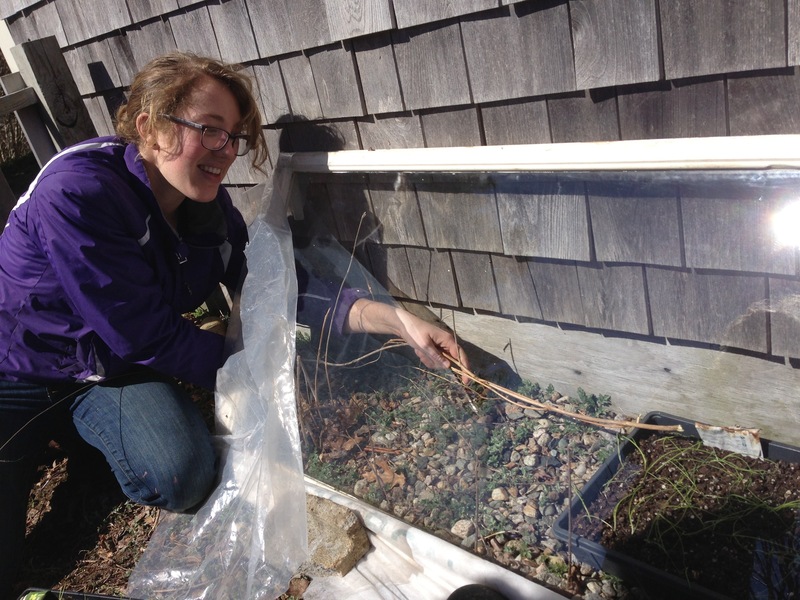 We stapled plastic (the very same plastic that tore free of our greenhouse during Nemo) on the ends and weighted it down with rocks to make a tight seal against the house and ground. Believe it or not, it got so hot in there yesterday that our empty seed packets we left in the trays as labels began to set on fire! We are using these cold frames to harden off our onions which we started inside earlier in the month! We have been keeping them under here night and day at this point. During the day, we allow full ventilation by freeing the plastic sides from the rocks. Around 3pm, we create the tight seal once more by weighing it down. Additionally, we rolled up old row covers as insulation along the ground where the window meets the earth (as you would line the bottom of a door in the winter in order to keep out a draft) and we drape plain old bed sheets over the glass. We also have some concrete blocks inside the cold frames. These act as thermal energy–soaking in the heat of the sun during the day, and releasing it during the night. The rolled up row cover, sheet coverings, and concrete blocks are all done in an attempt to keep the temperature within the cold frame at a higher temperature. We want to harden our onions off–not kill them in cold night! Here we have Tessa trying to retrieve a seed packet without upsetting the tilt of the cold frame! You can see the browning on the crease where the packet started to burn. This entry was posted in Cold Frame and tagged Accidental Combustion, Cold Frame, Heat, Misadventures with Drake and Tessa, Onions, Tessa. Bookmark the permalink.